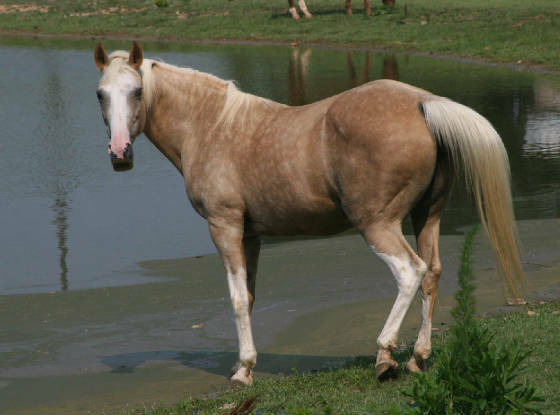 Cloud is a lovely 23-year-old gaited Palomino Paint mare with a dappled coat and hazel eyes. Her owner loved her dearly but had to give up the sweet mare in order to leave an abusive husband. Cloud was having issues with her front hooves and her husband would not allow the horse to have veterinary care. He was also known to vent his frustrations on the mare by punching her in the face. Digitals have been done on Cloud's front hooves and show slight rotation. She has been tested positive for low thyroid and insulin reistance. This means that she has to be on an inexpensive medication that can be added to her feed and cannot have grain, fruit, or sweets in her diet. Cloud is being ridden in our riding program but because we are only able to ride her for about an hour a week, we have not been albe to keep her weight in check. She has a lot of energy and has had very good training in her life. She has been on short rides off the premisis with our former endurance horse, Diego. Cloud will lead a group of horses but benefits from having an experienced horse with her to help boost her confidence and make her feel secure. She is 15 hands and is trained English. Cloud needs an experienced rider. If you are interested in this lovely mare, contact the sanctuary. Cloud is waiting for a loving, new home.